So guys, I wrote a book. I want a copy! Where can I get Popular? Popular is available through most major book sellers or online through Amazon here. Growing up isn’t easy in a world that rewards only the best and the most beautiful, and being in the middle is the worst place to be. Being popular, however, is everything when you are sixteen, or is it worse than being unseen? Take the journey through one high school hall that sees it all. From broken hearts, bad boyfriends, booze, and eventually back to faith, this is an honest look at what high school kids are facing every day. 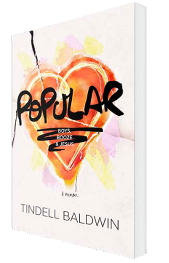 Popular is a heart wrenching memoir of a young girl’s path to find out who she is, and what her faith means. Stuck behind two “God squad,” over-achieving brothers, she searches for the one thing that she thinks will make her life important: popularity. In an attempt to rise to the top she trades everything she once held dear and finds herself broken-hearted and crawling back to her faith. Popular is for anyone who has struggled to find out who they are. Anyone who has ever wondered if their faith is real or anyone who has ever wondered what the dark side of sin is. It is for the cheerleaders and the debate team because deep down we are all searching for the same thing: a place to belong. Do I speak at events? I love connecting with churches and groups for speaking events where my message can resonate. For more information please reach out to me through the contact form from the link above. Thanks!